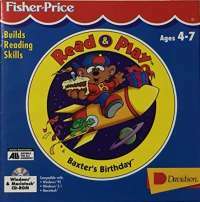 It was re-released as the 5th volume of the Fisher Price Read and Play Library collection. Today is Baxter's Birthday and the whole town is turning out to celebrate. Join Baxter and his friends as they explore the universe in search of the perfect birthday gift. Get ready for a huge birthday adventure with a parade, a western ice cream saloon, clowns, undersea music, a pig magician and a Pinata in outer space. Highlights: 7 fun activities; Hundreds of vivid animations; Highlighted words to help kids read along; 3 unique storytellers; 5 original sing-along songs; Lovable and entertaining characters. Skills Developed: Builds reading comprehension; Expands vocabulary; Improves communication skills; Develops problem-solving abilities; Stimulates creativity and expression; Develops a lifelong love of reading.